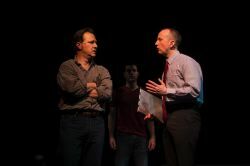 According to Sunday’s Washington Post, the Pulitzer Prize-winning Next to Normal is the fourth most frequently produced show by regional professional theaters in the 2012-2013 theater season. It is often chosen by local community groups as well, as evidenced by the current McLean Community Players (MCP) production, a concurrent production at the Kensington Arts Theater, to be followed by a showing at the Reston Community Players in March and at Taking Flight Theater Company last year. The MCP production, a combination of strong content and quality presentation, makes it easy to understand the show’s popularity. In an era where the death of the musical is often proclaimed and lamented, it is good news indeed to encounter a show, not written by someone named Sondheim (the authors are Tom Kitt and Brian Yorkey), that features intelligent writing, psychologically real characters, and a willingness to look squarely at the pain and losses of everyday life. 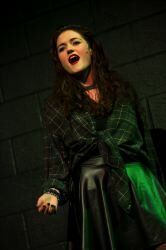 The show is labeled a “rock musical,” which does not do complete justice to the score, full as it is not only of driving energy but of quiet lyricism, carrying sometimes intricate and always articulate words that define the characters and their very individual feelings. The central character is Diana (Nicky McDonnell), a suburban housewife who, 16 years after the death of her toddler son, remains consumed by grief, triggering her increasingly severe bi-polar illness. 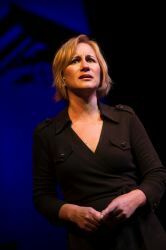 In pushing away her teenage daughter Natalie (Catherine Callahan), her steadfast husband Dan (Brent Stone), and the varying treatments prescribed by her psychiatrists, McDonnell’s Diana is fierce in her determination to hold onto her son and her own ability to feel vividly, even when what she is feeling is her own pain and darkness. McDonnell’s songs can be angry (“You Don’t Know”), full of longing (“I Miss the Mountains”), or reflective (“So Anyway”); she delivers them all with conviction. Diana’s primary relationship is with her dead son, Gabe (Nick DuPre). Now 18 in her mind, Gabe has a fierce determination of his own and a stronger life force (“I’m Alive”) than some of the living characters. The embodiment of his mother’s unending grief and deepening illness, DuPre’s Gabe is a hovering, mysterious, sometimes malignant spirit, blocked by director Lisa Anne Bailey to loom silently over even scenes in which he does not speak. Perhaps the most frightening moment of the evening is a waltz between Diana and Gabe (“I Dreamed a Dance”), a kind of totentanz, following which Gabe gently seduces her to attempt suicide (“There’s a World”). Gabe, who at another point discourages his mother from seeking psychiatric treatment, at times seems locked in an Oedipal struggle with Dan for control of Diana’s soul (“I Am the One”). Dan has had to be the rock in Diana’s disintegrating world, and the strain, emotional exhaustion, and frustration of the caregiver who wants to be a husband again are stamped all over Brent Stone’s performance. He is the one who has to try to hold on, both to Diana and his own sense of hope (“It’s Gonna Be Good”); to try mightily to pry Diana away from her attachment to Gabe (“He’s Not Here”); to try to persuade her to undergo one psychiatric treatment after another. In the end, he, like the other characters, must try to live with his losses with no assurance of things ever being made right (“Light”). Natalie is a bright, musical, achievement-focused teen (“Everything Else”) who knows full well that her mother has never noticed her, that her father is preoccupied with her mother’s illness, and who comes to self-medicate her pain with pills. 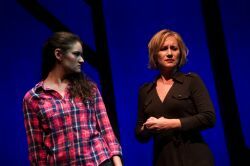 Callahan’s emotions in the role are as mercurial as one could ask of a self-aware girl missing her mother’s presence and fearful of becoming like her (“Hey #3″). Like Diana, she has someone in her life who is devoted to and patient with her, in Natalie’s case her boyfriend Henry (Alex Stone). Henry’s caring for Natalie parallels Dan’s for Diana, a point made clear by Bailey’s blocking of the two couples in “A Promise.” She tries often enough to push Henry away (“Superboy and the Invisible Girl”), but they are tentatively hopeful by the end (“Perfect For You” (Reprise)). As Diana’s psychiatrists Dr. Fine and Dr. Madden (the character names are perhaps a bit arch, but then Dan’s last name is Goodman), Quinn McCord – especially in the latter, more important of the two roles – portrays someone who must try to deal rationally with the irrational, looking for treatments that he knows provide no certainty of “cure,” whatever that may mean. He has a delightfully comic moment with Diana when she sees him as a scary rock star. 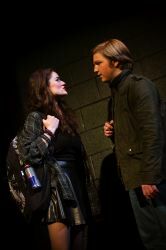 Next to Normal demands that the characters be portrayed as unflinchingly real, even in the midst of their weirdness and stress and notwithstanding the stylization inherent in a musical. The MCP cast passes this test with flying colors, being utterly believable throughout. 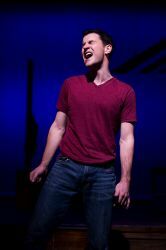 Next to Normal comes close to being a sung-through musical, and the singers and the orchestra, led by David Rhode, perform the extensive, difficult, and varied score with energy and feeling. The production is aided in no small measure by Jeffery Scott Auerbach’s complex and subtle lighting design, featuring a backdrop illuminated in various colors, well-defined area lighting and specials, use of dappled light and shadow effects in some scenes, and precise timing. Two split-second changes at important moments for Gabe (one involving a color change on the backdrop, the other a tightly focused overhead special) were particularly dramatic. 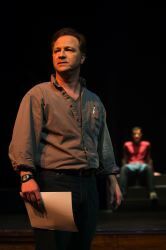 Michael Schlabach’s set design, involving five main playing spaces over two levels, is flexible and enables smooth flow from one scene into the next. The backdrop at times shows outlined, incomplete silhouettes of a roof and part of a house, underlining the brokenness of the Goodman family. Two of MCP’s cast members – Callahan and Alex Stone – appeared in last year’s St. Mark’s Players‘ production of The Secret Garden, and it is intriguing to think of analogies between two shows. Like Diana, Archibald Craven has never ceased to grieve over the long-ago death of a loved one, becoming nearly unable to function. The most intense and important emotional relationship both have is with their minds’ pictures of their lost ones. Their “ghosts” (to use the term from Secret Garden) are so real to Diana and Archie that they dance with them. In their nearly obsessive focus on their losses, both put aside a child who needs them. The analogy only goes so far, of course. Lily, who ultimately encourages Archie to move on with his life, is a more benign presence than Gabe, and the tone of The Secret Garden is far more sentimental than that of Next to Normal. Together, however, the two shows illustrate that, in capable hands, survival and at least some potential for hope following the cruelest of life’s disasters can be powerful material for musical drama. This article can be linked to as: http://showbizradio.com/go/9105.